As you know, I'm all about trying to match the background with my outfit, if possible! 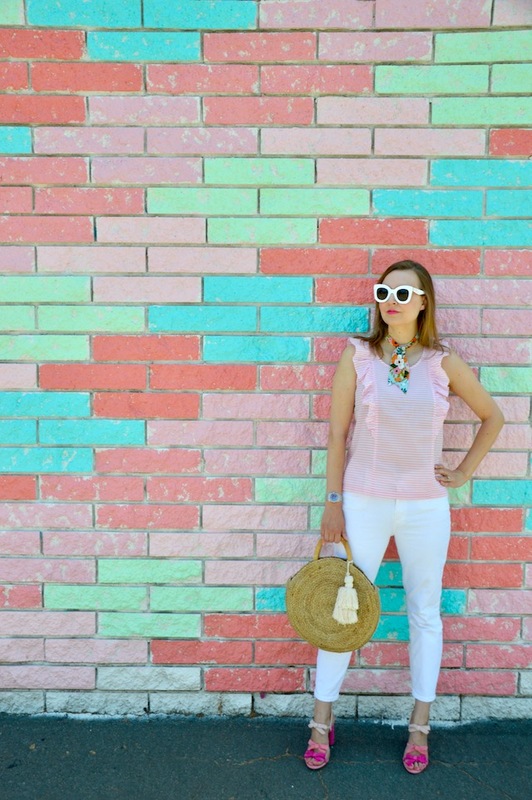 Thus, this pastel brick wall was the perfect backdrop for my new pink and white ruffle top and this floral skinny scarf from Daisy Faye Designs! Because the outfit I'm wearing is relatively simple with no loud prints or patterns, the skinny scarf is the perfect finishing touch! I also love the fact that the fabric for the skinny scarf is from Rifle Paper and Co. because their floral prints are to die for! Wearing this scarf tied around my neck definitely made me feel a little extra chic for the day! In case you are not familiar with Daisy Faye Designs, the owner, Kim, makes wonderful, whimsical scarves, clutches and accessories that are sure to brighten up anyone's wardrobe! I was so excited to be able to collaborate with her as a stylist for her brand, as her designs perfectly match my aesthetic! Plus, she is offering my readers an extra 15% off sitewide on anything in her store if you use the code KATIE15 at checkout! Because she rarely offers discounts, it's the perfect time to pick up something for yourself or as a gift for someone else. This offer is only good until June 15th so run, don't walk over to Daisy Faye Designs! 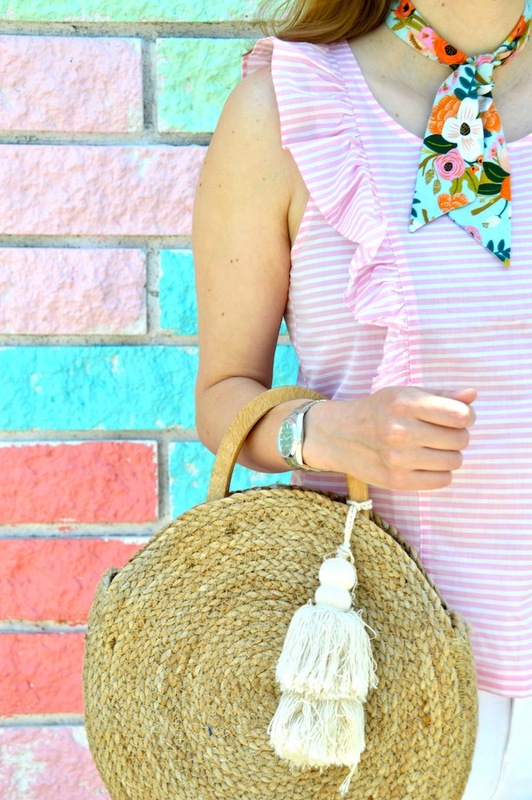 A very nice outfit, perfect for summer time!